I had to write part 1 in the title because I know that I'm going to be ordering more. Before I went to the store I had an entire list in mind but unfortunately a bunch of products I wanted wasn't available so I'm going to have to order them. Usually around the holidays I get excited about all the holiday kits that are out but this year there wasn't really anything that intrigued me. Everything I purchased isn't new or limited edition. I bought things that I knew I needed and that I've been wanting to try. But knowing me, after the sale ends tonight I know that there are going to be a ton of products that I wish I had bought but lets hope that doesn't happen. I cannot spend more money on makeup. The Urban Decay Naked 2 Palette was something that I was very indecisive about, did I need it? I barely use the first Naked palette but the colors are gorgeous in this one. I swatched most of the shadows onto the back of my hand and stood there for a good ten minutes trying to decide whether or not to get it. Since I have a lot of matte shadows I knew I needed this palette, it's very neutral as well which is what I love. I've read a few blog posts about the NARS All Day Luminous Weightless Foundation and majority of the reviews said that it seemed to be better for oily skin. I've really been loving the luminous look lately even though I have oily skin but I always carry around blotting papers so that helps. I'm really hoping this works well with my skin. The Fresh Youth Preserve Face Cream and Origins Super Spot Remover are both repurchases. I continuously use these two skin care products and they work really well with my skin. 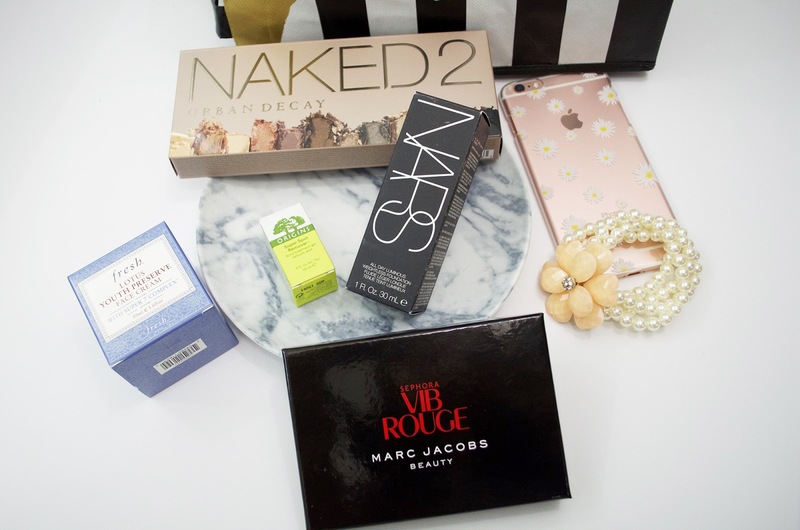 Have you purchased anything from Sephora recently?